The Most Interesting Man is bummed out. He's depressed. He's sad. Why? Because Cinco de Mayo falls on a Monday. A Monday! What a bummer! No one wants to party on a Monday. That'd be like trying to get the Geico Camel to do his Hump Day thing on a Saturday. But the Most Interesting Man is, of course, Most Interesting because he always has a solution, an answer, a more exciting way of doing something. And so to stave off the Monday blahs, he's come up with Dos de Mayo. Yup, that's right. The party starts Friday and leads up to Monday. The campaign comes complete with an inforgraphic celebrating Dos de Mayo, a Twitter hashtag (#dosdemayo) and a party in LA in partnership with Rolling Stone. 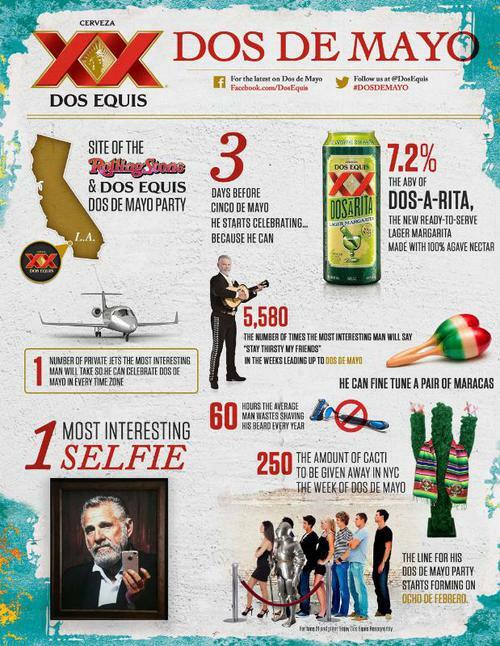 It's all to introduce Dos Equis new drink, the Dos-A-Rita.